The goal of this research to tackle the pressing challenges in disease surveillance and control by developing and deploying novel data analytics and machine learning techniques for envisioning spatio-temporal risk patterns of infectious diseases, so as to inform health care decision making. As an example, one of our tasks is to computationally model and infer disease diffusion patterns for emerging/re-emerging diseases and their underlying transmission dynamics; such understandings would enable public health authorities to timely detect, monitor, and control disease spread or epidemic outbreaks. In our network-based approach, unlike the existing methods (e.g., SaTScan clustering), we have introduced the notion of disease diffusion networks, each of which consists of a set of nodes that characterize infection cases over time in a certain host sub-population or location and a set of directional links that capture the probabilities/likelihoods of disease diffusion between sub-populations or locations. The computationally-inferred diffusion networks would allow policy makers to better understand and predict when, where, and how certain disease transmission patterns will emerge, and furthermore what will be their underlying pathways as well as hidden impact factors, such as ecological, environmental, biological, socio-economic, and behavioral factors (e.g., hidden mosquito ecology/evolution, household conditions, and human mobility patterns over space and time). • To conduct empirical validations of the developed methods as well as their applications to the real world by implementing prototypes and testing them in modeling and predicting disease transmission patterns based on some available surveillance datasets. H. Pei, B. Yang, J. Liu, and L. Dong, “Group sparse Bayesian learning for active surveillance on epidemic dynamics,” in Proceedings of the 32nd AAAI Conference on Artificial Intelligence (AAAI 2018), pp. 800-807, 2018. Q. Tan, J. Liu, B. Shi, Y. Liu, and X.-N. Zhou, “Public health surveillance with incomplete data: Spatio-temporal imputation for inferring infectious disease dynamics,” in Proceedings of 2018 IEEE International Conference on Healthcare Informatics (ICHI 2018), pp. 255-264, 2018. B. Yang, H. Pei, H. Chen, J. Liu, and S. Xia, “Characterizing and discovering spatiotemporal social contact patterns for healthcare, IEEE Transactions on Pattern Analysis and Machine Intelligence, 39(8):1532-1546, 2017. G. Zhu, J. Liu, Q. Tan, and B. Shi, “Inferring the spatio-temporal patterns of dengue transmission from surveillance data in Guangzhou, China,” PLoS Neglected Tropical Diseases, vol. 10, p. e0004633, 2016. 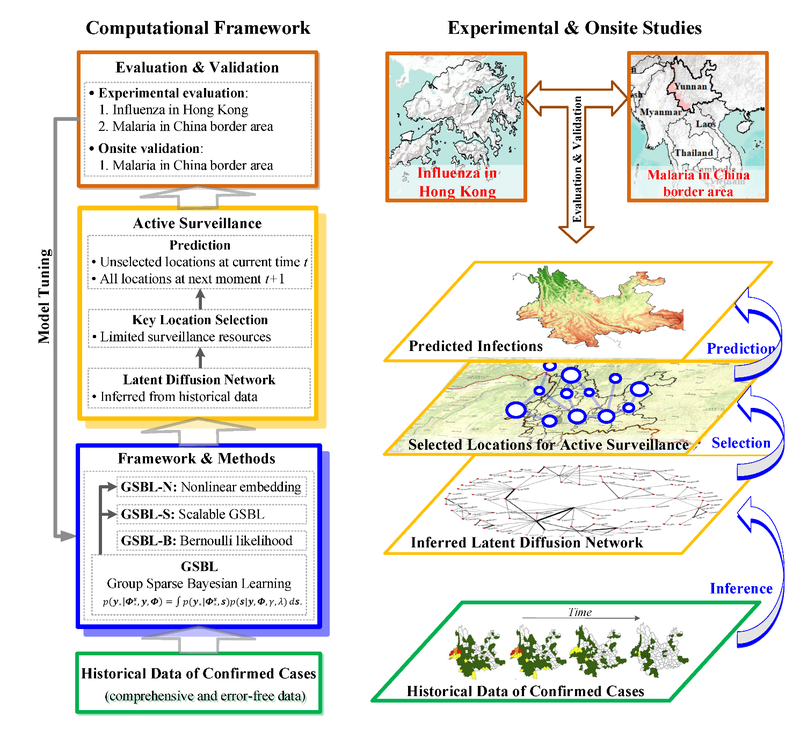 B. Yang, H. Guo, Y. Yang, B. Shi, X.-N. Zhou, and J. Liu, “Modeling and mining spatiotemporal patterns of infection risk from heterogeneous data for active surveillance planning,” in Proceedings of the 28th AAAI Conference on Artificial Intelligence (AAAI 2014), pp. 493-499, 2014. B. Shi, J. Liu, X.-N. Zhou, and G. Yang, “Inferring plasmodium vivax transmission networks from tempo-spatial surveillance data,” PLoS Neglected Tropical Diseases, vol. 8, p. e2682, 2014. B. Shi, S. Xia, G. Yang, X.-N. Zhou, and J. Liu, “Inferring the potential risks of H7N9 infection by spatiotemporally characterizing bird migration and poultry distribution in eastern China,” Infectious Diseases of Poverty, vol. 2, p. 8, 2013. J. Liu, B. Yang, W. K. Cheung, and G. Yang, “Malaria transmission modelling: A network perspective,” Infectious Diseases of Poverty, vol. 1, p. 11, 2012. This project is supported by the Research Grants Council (RGC), Hong Kong SAR, China (Project HKBU 211212, 12202415, and 12201318). For further information on this research topic, please contact Prof. Jiming, LIU.